Obviously it’s too late for this post (which is partly why I delayed it: I don’t want to seem like a self-help site), but the biblio-Valentine seems fairly well established. About Blooks shows a couple among pictures of bookish Valentine’s cards. Contrary to the assumption which most of us probably have, this is not however only a modern phenomenon. 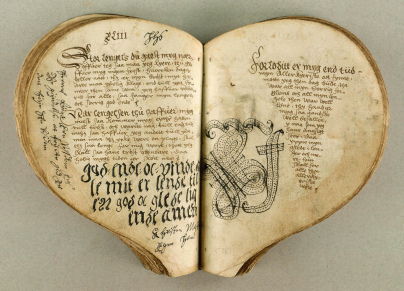 Medieval Books shows a couple of heart-shaped books among a bunch of odd-ball books from before the days of print. Here’s a link to other examples presented by Erik Kwakkel.